Observed growing along Black Canyon Creek near Bumble Bee, Yavapai Co., Arizona. April 2008. 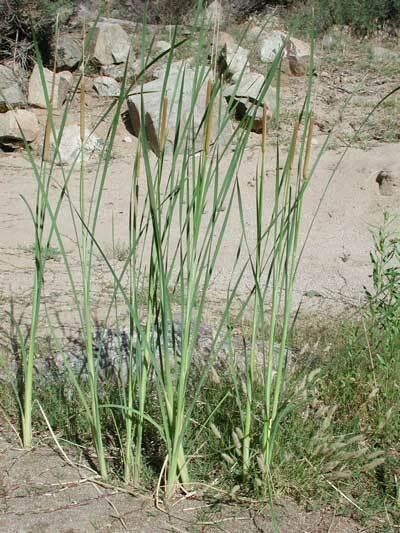 PERENNIAL: Tall herbaceous perennial of wet or marshy soils reaching two meters in height. FLOWERS: Numerous flowers on densly packed spikes. The staminate (male) flowers are at top of spike separated from the pistallate (female) flowers below. LEAVES: Leaves are narrow, strap-like blades a meter or more in length ca. 1 cm wide. In cross section bottom edge is convex. RANGE: Where fresh water is more-or-less permanent, at least within a few cm's of the surface, cattails soon become established. Riparian streams and near city/agricultural water supplies. FRUIT: Numerous dry, minute seeds with hairs that promote wind dispersal.